Dimentio is a villain in Super Paper Mario. His name is a pun on dementia and dimension. Like Mario and Mimi, he can flip between dimensions, but he can also manipulate them (an ability he shares with Merloo) and controls Dimension D, which he designed. Skilled in duplication, teleportation, and invisibility, Dimentio is one of the four main minions of Count Bleck, along with O'Chunks, Mimi, and Nastasia. However, over the course of the game, Dimentio eventually reveals himself to be the true main antagonist, using his "master" merely as a way to further his plans to obtain the Chaos Heart and use its power for his own agenda. According to The InterNed, his theme is called "Dimentio, Charming Magician" and his battle theme is called "It's Showtime". Dimentio uses his magic to make Fracktail malfunction. According to Carson, Dimentio approached Count Bleck on his own, wishing to join him. While he was turned down once, he was hired after Bleck read about someone having a similar role in the Dark Prognosticus.. Any other information related to his past is limited and contradictory. One of Carson's stories implies that Dimentio may be the descendant of the magician who created the Pixls. Regardless of his exact role in the Prognosticus, Dimentio quickly became involved in Bleck's attempt to fulfill it, if only for his own ends. Dimentio fights Bowser in Dimension D.
Dimentio is first shown at a meeting between Count Bleck and his other minions, not contributing until Nastasia mentions the appearance of the possible hero of prophecy (Mario). He decides to go to Yold Desert with O'Chunks to see this hero for himself, though he doesn't meet him until moments before he uses magic to force Fracktail, the robotic guardian of the second Pure Heart, to attack Mario. Despite this being the first encounter between Dimentio and the protagonists, Tippi immediately recognizes him, though no one seems to notice (the fact that Tippi recognized Dimentio may support Carson's story, as both Tippi and the magician were members of the tribe of the ancients). After Fracktail's defeat, Dimentio realizes that Mario may actually be the hero of prophecy and initiates a secret plan. Dimentio soon learns that the prophecy tells of four heroes rather than one and concludes that Princess Peach, involved in the creation of the Chaos Heart, will be the second hero. He warps her from Castle Bleck (where she is held captive) to Flipside so she can join Mario. Dimentio likely does something similar with Bowser, who wakes up in the Bitlands with several of his minions, although it is never explicitly stated or shown. Eventually, after Mario and friends defeat O'Chunks and Mimi, Dimentio is sent to get rid of the heroes. Instead, he tests their strength by fighting them in Dimension D. After beating him, Dimentio states that he expected the heroes to beat him, returns them to The Dotwood Tree, and leaves. A scene is then shown of him muttering to himself about assisting the heroes and helping them to become strong enough to defeat Bleck. Dimentio sending Mr. L away to The Underwhere in the World of Nothing. Upon his return to Castle Bleck, Dimentio learns that Luigi is the ideal host for the Chaos Heart's power. After eavesdropping on a conversation between Bleck and Nastasia, Dimentio travels to The Land of the Cragnons to meet an "acquaintance," and obtains two Floro Sprouts, testing them when O'Chunks is ordered to defeat the heroes there. Before the fight begins, Dimentio warps O'Chunks to Dimension D, increasing the latter's strength. Once the heroes defeat him, a Floro Sprout manifests on O'Chunks's head, causing him to become Dimentio's servant, as well as powering him up. After they defeat O'Chunks, Dimentio is certain that Mario and his friends are almost ready to confront Bleck. With functional Floro Sprouts in his possession, Dimentio next plans to unite the fourth hero with the other three. Luring Mimi and Mr. L to Sammer's Kingdom in order to distract the heroes, he waits until the dimension is obliterated by The Void, the heroes return to the kingdom in search of its Pure Heart, and Mr. L engages them in combat. Capitalizing on Mr. L's defeat, Dimentio uses magic to release Luigi from Nastasia's hypnosis and send him to The Underwhere, where those whose games have ended are judged. Dimentio then tracks Mario, Peach, and Bowser to Flipside and repeats the performance, indirectly allowing Mario and his friends to repair the Pure Heart and eventually return to the world of the living. To cover his tracks, Dimentio meets with Bleck and informs him that Mr. L has joined the heroes. Dimentio steals the Chaos Heart shortly after Count Bleck's defeat. As the heroes gather the last Pure Heart, Dimentio finalizes his plans. He begins by informing Bleck that Tippi uttered the name "Blumiere," knowing that Bleck would be weakened by what that name meant (namely that his lost love, Lady Timpani, is alive rather than dead as Bleck had assumed). Next, taunting Mario and Luigi as they travel through Castle Bleck, Dimentio manipulates the reflections of the castle mirrors and creates hundreds of clones to confuse the duo as he shoots energy blasts at them. When they finally confront him, he initiates a game of "magic tag," making the brothers chase him through every dimension they visited during their quest. Once the chase is over, he reveals his intentions and offers to have Mario and Luigi join him in defeating Bleck, when in actuality, he plans on enslaving them with Floro Sprouts, as shown if the player accepts his alliance. After Dimentio explains how he's been "helping" the heroes the whole time, Tippi realizes that Dimentio is untrustworthy and encourages the brothers to refuse. They do so, and Dimentio insults Luigi, who then decides to attack Dimentio alone. Luigi fights and beats Dimentio only to be trapped in a magic force field with him. Under the pretense of ending his and Luigi's games, Dimentio uses magic to plant a Floro Sprout in Luigi's subconscious and waits for Bleck's defeat. Dimentio then attempts to finish off his master, but his attack is blocked by Nastasia. Dimentio triggers Luigi's Floro Sprout, turning him back into Mr. L. He then merges with Luigi's and the Chaos Heart to form Super Dimentio, simultaneously sending Bleck, Tippi, and Nastasia to Dimension D, declaring his intention of torturing Bleck after he is finished with the remaining Heroes of Light. Armed with the power of the Chaos Heart, Dimentio remakes Castle Bleck in his image and battles the remaining three heroes for the fate of all worlds. Believing the energy of the Pure Hearts exhausted during their use in the fight with Bleck, Dimentio is about to defeat the heroes when his plans are interrupted by the reemergence of the Pure Hearts, born out of the love and loyalty Bleck's minions have for him. The combined power of the Pure Hearts makes Dimentio vulnerable, and he is eventually defeated. Uttering his signature "Ciao!" for the last time, Super Dimentio spits out Luigi and the Chaos Heart and then explodes, still laughing. It is quickly revealed by Bleck that despite this, Dimentio left behind "a shadow of his power" to continue controlling the Chaos Heart. With time running out, Count Bleck announces that the only way to destroy the Chaos Heart is through true love. He and Tippi exchange vows at the same altar where Peach and Bowser were married and where the Chaos Heart was created, activating the true potential of the Pure Hearts and completely destroying the Chaos Heart. Dimentio's plans are thus permanently undone as the dimensions consumed by The Void return to normal. Dimentio's appearance in Super Mario-Kun. Dimentio makes an appearance in volumes 37 and 38 of the Super Mario-Kun manga, in the story arc based on Super Paper Mario. Since the arc is based upon the story in Super Paper Mario, Dimentio's roles in the manga mirror that of the game. Dimentio appears as a spirit in Super Smash Bros. Ultimate. His fighter is Meta Knight, with a giant Luigi as his reinforcement (referencing Super Dimentio). 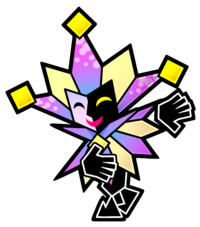 Dimentio's physical appearance resembles that of a jester. He primarily wears a cap and cape with purple and light-yellow stripes, with the purple striped portions of the cap containing jingle bells on each end. Underneath the cape, he has two black hands separate from his body (which he usually tucks under his cloak while hovering), as well as black pointy-ended shoes. His face is stylized after a theatrical mask, split in half so that the right side is white and the left side is black. The eyes likewise are differently colored: black for the right eye, and yellow for the left. His mouth is colored red and usually set in a grin. Dimentio, being a magician, is capable of many special abilities and powers. Dimentio is able to flip between 2D and 3D and cross between worlds. Dimentio has also created his own dimension, Dimension D, which is said to empower anyone within it. Dimentio can teleport and conjure shuriken-like objects to shoot at his foes. He can also clone himself, though the clones are intangible. While cloned, Dimentio and the clones can shoot three magic shurikens at once. He is able to create a compact magic field around his victims in which he simply snaps his fingers, which causes several explosions within the field. Dimentio's 'Warp', used by nearly all the villains at some point, also has its own distinctive animation and sound. A square expands then contracts on the teleporting object, making it disappear with a sound while a small shock-wave distorts the air around it. He is also able to fly and hover, never walking at any point in the game. Dimentio covers up his true intentions. Dimentio initially appears to be a lighthearted villain, but also shows a psychopathic side. He is very mischievous, and gets most of his information by eavesdropping on Count Bleck and the other minions. He often speaks in a mocking or condescending manner and constantly smiles, only breaking his grin upon defeat. He has a very colorful style of speech, using numerous analogies throughout the game and often throwing gleeful insults at the heroes. He is also intelligent and a skilled actor and liar, being able to fool all of his peers into believing his loyalty is true. Dimentio appears to be rather sadistic, taking pleasure in attacking his enemies and ending the games of Mario, Peach, Bowser, Luigi and even himself (though his game-ending explosions were not truly lethal and had only transported those caught in them elsewhere). The fact that Dimentio had no qualms about recreating the universe in his own image, even viewing it as "perfect", shows that he held the lives of others in no regard and only cared about himself. He is very confident, never believing there was even a chance of him failing to get his hands on the Chaos Heart. Despite believing that his goals are justified, he understands that the heroes see him as evil. The value of a person to Dimentio appears to be measured solely on how useful they can be for him. Throughout the story, he seemed to have a mutual respect for Mario and the others, but then quickly decides to end their games when he felt that Luigi was the only one of any use to him. When he openly reveals his disloyalty to Count Bleck near the end of the game, he appears to be angered by the count's intentions to wipe out existence and leave it ruin, but his true feelings toward his master are unknown, as he was only acting in order to coerce Mario and Luigi into joining him. Card Description Dimentio is Count Bleck's dimension-bending mercenary. The question is, do psycho jesters get good benefits? "Yes, yes, no one likes the icky stuff... Yessss... A perfect world... Sounds magical!..." "It would be so very DULL if your journey ended so easily... Instead, it ends with...magic!" "It is truly enchanting to finally meet my hapless victims." "Well met, lady. Your beauty is as refreshing as a slap to the face on a crisp winter day!" "At last, the hero... I know of you from the festival of hair that dances upon your lip!" "Your blows are like miniature jackhammers wielded by tiny, angry road workers!" "The next time we meet, you will feast on a deadly eight-course meal!" "I am not violent by nature, you know. I'd prefer to settle this peacefully, in fact." "You've proven to be worthy foes in the past, so I'm not going to make it easy." "I'm saying that you no longer have value to me, so I'm ending your games." "And so I strike, like an unseen dodgeball at an echoing gymnasium!" Dimen From the word "dimension"; same as Japanese name. Dimentio has an unused walking animation within his model. This can be found by replacing a walking NPC with him. Both Tippi and Princess Peach claim to recognize Dimentio at some point. The reason behind this is unknown. ↑ Super Paper Mario. The Cutting Room Floor. Retrieved January 15, 2017. This page was last edited on February 10, 2019, at 00:03.